The Montreal bagel, (sometimes beigel; Yiddish בײגל beygl), is a distinctive variety of handmade and wood-fired baked bagel. In contrast to the New York-style bagel, the Montreal bagel is smaller, sweeter and denser, with a larger hole, and is always baked in a wood-fired oven. It contains malt, egg, and no salt and is boiled in honey-sweetened water before being baked in a wood-fired oven, whose irregular flames give it a dappled light-and-dark surface colour. In many Montreal establishments, bagels are still produced by hand and baked in wood-fired ovens, often in full view of the patrons. There are two predominant varieties: black-seed (poppy seed), or white-seed (sesame seed). 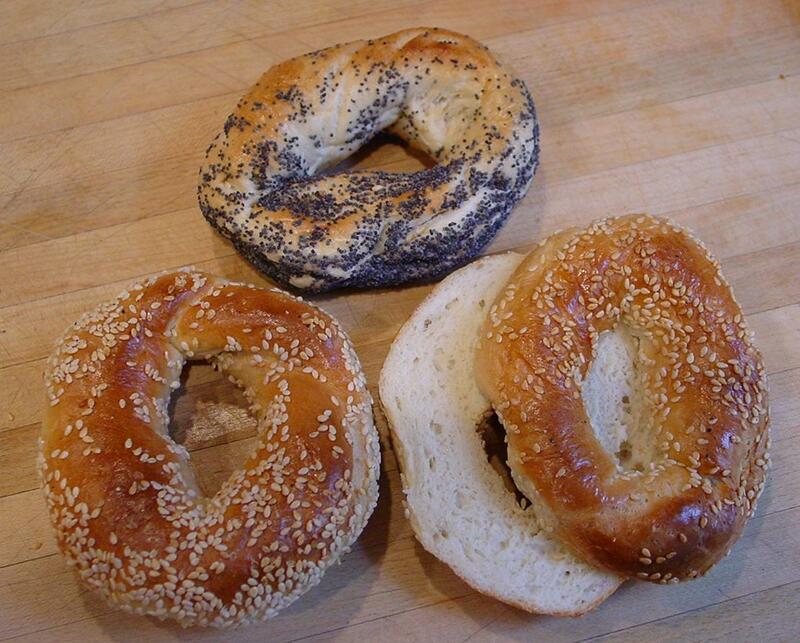 Montreal bagels, like the similarly shaped New York bagel, were brought to North America by Jewish immigrants from Poland and other Eastern European countries; the differences in texture and taste reflect the style of the particular area in Poland in which the immigrant bakers learned their trade. Minor controversy surrounds the question of who first brought the bagel to Montreal. They were (reportedly) first baked in Montreal by Chaim (Hyman) Seligman, as verified by Montreal historian Joe King, a historian of Montreal Jewry. Seligman first worked in the neighbourhood community of Lachine and later moved his bakery to the lane next door to Schwartz's Delicatessen on Boulevard St. Laurent in central Montreal. Seligman would string his bagels into dozens and patrol Jewish Main purveying his wares, originally with a pushcart, then a horse and wagon and still later from a converted taxi. Seligman went into partnership with Myer Lewkowicz and with Jack Shlafman but fell out with both of them. Seligman and Lewkowicz founded the St. Viateur Bagel Shop in 1957 and Shlafman established Fairmount Bagel in 1919, which both still exist in the present day. A substantial proportion of Montreal's English-speaking Jewish community gradually left for other locales. Catering to this population, Montreal-style bagel shops have opened in Vancouver, Ottawa, Toronto, Hamilton, Calgary, and other Canadian, and even US cities, such as Burlington, Seattle, Houston, Los Angeles & Oakland, CA and Portland, Oregon. For a time this style of bagel was almost completely unknown in the northeastern U.S. despite its proximity to Montreal, mainly due to the proximity of the rival New York City bagel. (with one exception having been in Burlington, Vermont, where Myer's Bagels boasts both a Montreal-style wood oven and Lloyd Squires, a former St-Viateur Bagel Shop baker). However at present in New York City, there are two Montreal-style bagel locations in the borough of Brooklyn within four blocks of each other. Montreal-style bagels are currently the only style of bagel to have ventured into space. Gregory Chamitoff, who grew up in Montreal, took three bags of sesame bagels with him on his assignments to STS-124 as passenger and ISS Expedition 17 as crewmember.